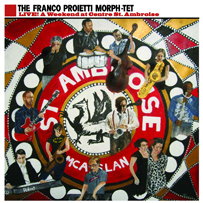 This is the Franco Proietti Morph-Tet's second album, Live! A Weekend at Centre St-Ambroise (a cozy performance spot owned by the micro-brew of St. Ambroise beer). Recorded in the intimate St-Henri venue located right on the brewer's premises, on September 25 & 26, 2009, this album raises the roof and brilliantly captures the band's sound & energy. "I wanted to do a live album which reflected the current group's diverse influences, from bop, hip hop and funk to soul. The Morph-Tet is a moving train of ideas and musicians." says bandleader Franco Proietti. At the group's core is Andrew Kushnir (DJ), Fernando Gelso (drums), and J.F. Martins (bass). Along the way, the Morph-Tet added Dustin Good (guitar), Averil Parker (alto sax), Melissa Pipe (baritone & flute), Kim Desjardins (tenor sax, baritone & flute), Jonathan Emile (vocals), and of course, many guests. Live! A Weekend at Centre St-Ambroise also features many local vets and family including Chris Tauchner (keyboards) & Joshua Gearey (live FX), who were both in Kobayashi, Brie Neilson & Genevieve Schreier (vocalists from the Unsettlers), Felix Del Tredici (trombone) and Ron Proietti (harmonica). The St-Ambroise Centre & McAuslan Breweries have played a pivotal role in helping local artists like the Morph-tet, and accolades for the band are still coming in, with the Morph-tet having been voted the #4 Best Jazz Act in Montreal two years in a row in the Montreal Mirror's "Best Of Montreal" poll, not to mention making the 2009 Grammy Jazz shortlist with their debut, Morphology. La maison de disque Bongo Beat Records est heureuse d'annoncer le lancement tant attendu de Live! A Weekend at Centre St-Ambroise, le deuxième album du groupe acid-jazz montréalais Franco Proietti Morph-Tet. Enregistré devant public les 25 et 26 septembre 2009, l'album Live! A Weekend at Centre St-Ambroise, capture de façon magistrale l'énergie et le son du groupe. Franco Proietti, leader du groupe, raconte : « Je voulais faire un album-concert qui reflèterait bien le son et les diverses influences que chaque musicien apporte au groupe, que ce soit le bop, le hip-hop, le funk et la soul ». À sa base, les membres sont Andrew Kushnir (DJ), Fernando Gelso (batterie) et J.F. Martins (basse). En chemin, le Morph-Tet a rassemblé Dustin Good (guitare), Averil Parker (sax alto), Melissa Pipe (baryton & flûte), Kim Desjardins (sax ténor, baryton & flûte), Jonathan Emile (voix) et, bien sûr, plusieurs invités d'honneurs au fil des ans. Ont également participé à cet enregistrement plusieurs vétérans de la scène locale, dont Chris Tauchner (claviers) & Joshua Gearey (Live FX) - tous deux d'anciens membres du groupe Kobayashi - Brie Neilson et Genevieve Schreier (chanteuses du groupe The Unsettlers), Felix Del Tredici (trombone) et Ron Proietti (harmonica).